Gardens, apples and pumpkins | A balanced diet . . .
For one weekend last September, I almost felt like a ‘latter-day Johnny Appleseed‘. I hadn’t seen so many apples in a long time, nor been apple picking before. Seems it’s quite a family outing sort of thing in Minnesota, towards the end of September, and especially if the weather is fine—maybe an Indian Summer day even. 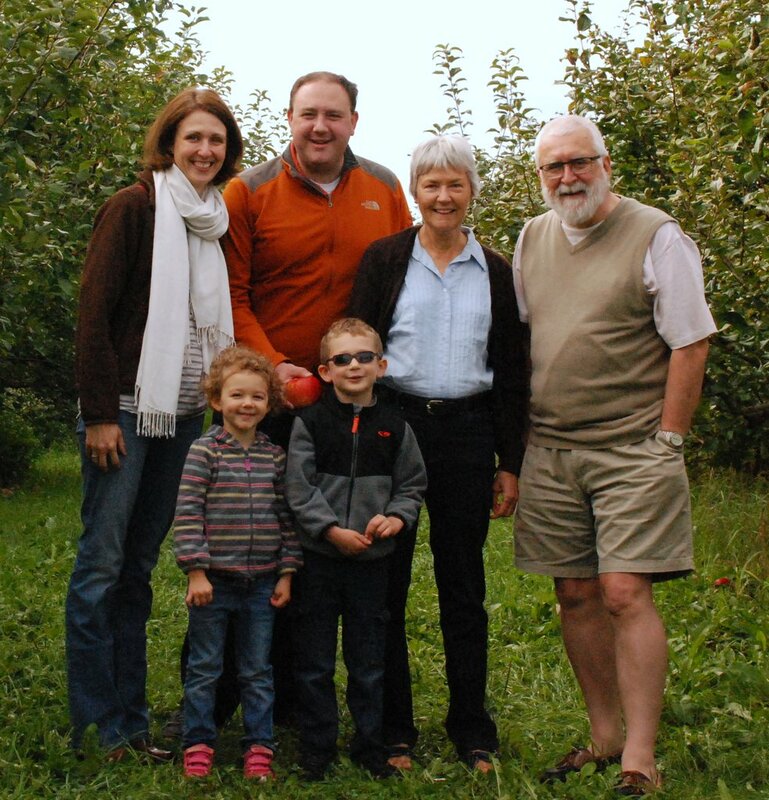 Steph and I flew to the USA on 10 September to spend almost three weeks with our daughter Hannah, son-in-law Michael, and grandchildren Callum and Zoë in St Paul, Minnesota. And we still can’t believe how lucky we were with the weather this vacation. Almost every day for the entirety of our stay (including a side trip to Chicago), the weather was bright and sunny, hot even with days often in the low 80sF. The first weekend in St Paul, Hannah and Michael took us to the Minnesota Landscape Arboretum (part of the University of Minnesota), around 23 miles due east of Minneapolis-St Paul International Airport, along I-494 W and MN-5 W. There are miles and miles of roads and trails to explore, but with two small children of 5 and 3 in tow, we limited our visit to a walk through the various glades and gardens close to the arboretum’s Oswald Visitor Center (map). Hannah and Michael had taken Callum and Zoë to the arboretum on 4 July, when there was an impressive display of Lego sculptures around the gardens. On the Sunday of our second weekend in St Paul, we met up with Hannah and Michael’s lovely friends, Katie and Chris and their daughters Nora and Annie, to go apple picking at a farm in the valley of the St Croix River (that joins the mighty Mississippi just five miles south), about 30 miles southeast from their home in the Highland district of St Paul. Thanks to Katie for several of the photos below. The Whistling Well Farm offers several apple varieties for picking, as well as pumpkins and pot chrysanthemums for sale, and chickens to feed. Chrysanthemums almost ready for sale. It’s a great place for the children to explore, and to get thoroughly wet. There was a heavy dew! 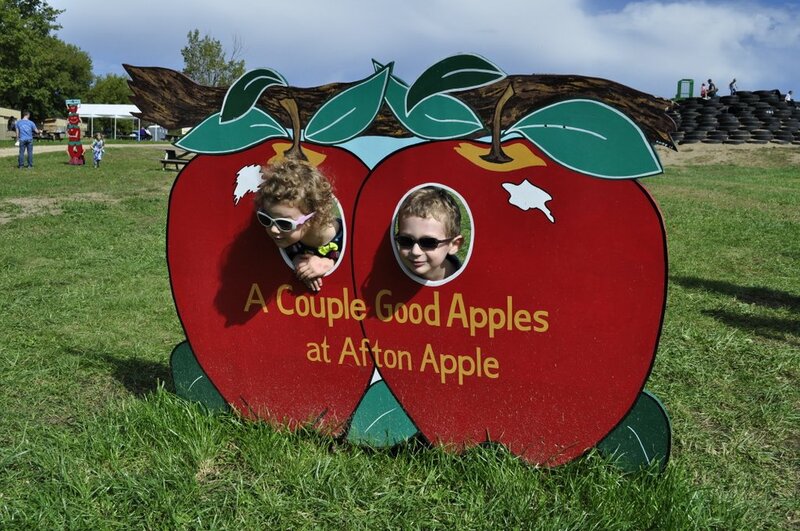 Having ‘exhausted’ possibilities at Whistling Well Farms, we journeyed just a couple of miles west to Afton Apple Orchard, to take a trailer ride around the orchards and pumpkin fields. What a lovely way to enjoy the company of family, especially grandchildren. L to R: Hannah, Zoë, Michael, Callum, Steph and me. This entry was posted in Out and about, People, Travel and tagged family, grandchildren, Minnesota, St Paul.